Jaipur is famous for legendry tales of love and valor. It is famous for the Palaces and Fort and other important monuments of interest of which the Rambagh Palace is the most outstanding. This legendry Palace has now been taken over by the Taj Group of Hotels and has been converted into a Five Star Heritage Hotel with all modern luxury facilities and services. This Rambagh Palace has been the home to the members of the Royal families for over two centuries. We at Touristplacesinindia.com provide you with complete information on all that you want to known about Rambagh Fort. The Palace which was later refurbished into a royal guesthouse and hunting lodge was built in the year 1835 on a modest scale for Kesar Badaran, the queen’s favorite handmaiden. In the year 1925, it was converted into a Palace by Man Singh II after his return from England and it became the seat of the Maharaja of Jaipur. This Palace popularly known as the “Jewel of Jaipur” has been the home for Royal family till 1957 when it was converted into a luxury hotel by Maharaja Man Singh II. 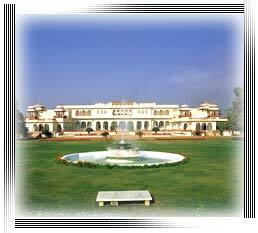 This Palace became the property of Taj Hotels in the year 1972 and became one of the finest Hotels in Rajasthan. This Palace offers the guests a living among opulence and luxury that was once enjoyed by the Maharajas of Jaipur. The Palace is surrounded by manicured gardens which draw its inspiration from Mughal and Rajasthani styles of architecture. This Palace hotel offers a wide range of services to the guests. The elegantly decorated rooms and luxury suites invites the guests for a pleasant stay in the city amidst luxury and opulence. Each of these rooms gives a glimpse of the royal heritage that once existed in this city of Rajasthan. These are a total of 79 rooms with modern in room facilities like in room dining, attached bath with luxury bath amenities, work stations, telephones and mini bars. This Palace hotel also offer services like astrologer, bank service, shopping arcade, express laundry, currency exchange and acceptance of major credit cards. The hotel also has well equipped conference and banquet hall facilities and offers world class dining in its multi-cuisine restaurant offering wonderful Indian and International cuisines. Besides this, the hotel has bars and swimming pool for the guests to recreate.